I generally like old-fashioned fruit puddings, so I was pleased when I saw a recipe for Apple Pudding in a hundred-year-old cookbook. Most modern apple recipes call for cinnamon and other spices, so I was surprised that this recipe didn’t use any spices. But they weren’t needed–the Apple Pudding was pure apple and delightful. The apples were embedded in a lovely moist cake pudding. In general the directions in this old recipe are a little vague. It provides no clue how many apples should be used; and I was left to decide what a moderate oven meant. However, the recipe was very specific that Cleveland’s Superior Baking Powder should be used. Of course, I’ve never heard of Cleveland’s and it’s probably not been made for decades. So I had to make due with a modern baking powder brand, which worked just fine. This recipe may have been originally published by the Cleveland Baking Powder Company. Perhaps Mrs. Wm. Mock liked it, and submitted the same exact recipe for the church cookbook. Preheat oven to 350° F. Place sliced apples into a 7 1/2 X 12 X 2 inch rectangular casserole dish, or other similarly-sized dish. Put butter, sugar, flour, baking powder, egg, and milk into a mixing bowl; beat until smooth. Pour the batter over the apples. Place in oven and bake for 1 hour – 1 hr, 15 minutes, or until an inserted toothpick comes out clean. Serve warm or cool. If desired, may be served with whipped cream or milk. Posted on September 4, 2016 September 4, 2016 by SherylPosted in FoodTagged apple, dessert, recipe. Sounds simple and lovely! Called for a bit of creativity on your part, though, deciphering the recipe. Cheers to you! Apple season is fast approaching. We have an early apple tree in our backyard so I’ve been enjoying apples for awhile. I love anything with baked apples and this recipe looks easy and tasty. Just can’t help but wonder – the directions mention the apples put at the bottom of the pan, while in the photo look like they are on top? I put the apples in the bottom of the pan – but the batter is quite thin so it ran down between the apples. And when the Apple Pudding was cooked, the apples ended up being a little higher than the cake pudding. They are picking apples now in the mountains of NC. Great timing! It’s wonderful to hear that the timing was good. What a neat idea to include a “print” button! I remembered we have some apples, and we’re having a party tomorrow. The printed recipe is here now, ready to use. Many thanks! You’re welcome. I think that you’ll like it. If you make it, it would be wonderful if you get a chance to add any comments you may have about how it turned out. It’s really helpful to other readers to read about others’ experiences. I always enjoy apple season. There are so many wonderful apple recipes. Mmmm! How interesting that leaving out the spices gives it a different, yet pleasing, taste! I remember helping my grandmother dry apples to be saved for baking things like this. I would have never thought of it, but I bet that this recipe would work well with dried apples. The batter that is poured over the apples is relatively thin – so the cooking time if fairly long. Dried apples probably would absorb some of the liquid and reduce the cooking time. I’ve been using a lot of apples lately…probably since fall is right around the corner! What kind of apples did you use for this pudding? I used some apples from a tree in my backyard that produces apples very early in the season. The tree was in the yard when we bought the house, so I’m not positive which variety it is, but it may be Sweet Sixteen. The recipe should work with other varieties. Neat! Must be nice to have an apple tree in your backyard. I’ve been on a sweet apple kick (Gala, mainly). This is very similar to an apple cake I found a recipe for last autumn. With the abundance of apples at this time of year it makes a wonderful afternoon tea, gouter here in France, for the children. Yes, it would be lovely for afternoon tea. That’s a delicious looking apple pudding. I’ve never heard of homemade apple pudding before. I like that it didn’t call for cinnamon. Like you, I also find it curious. 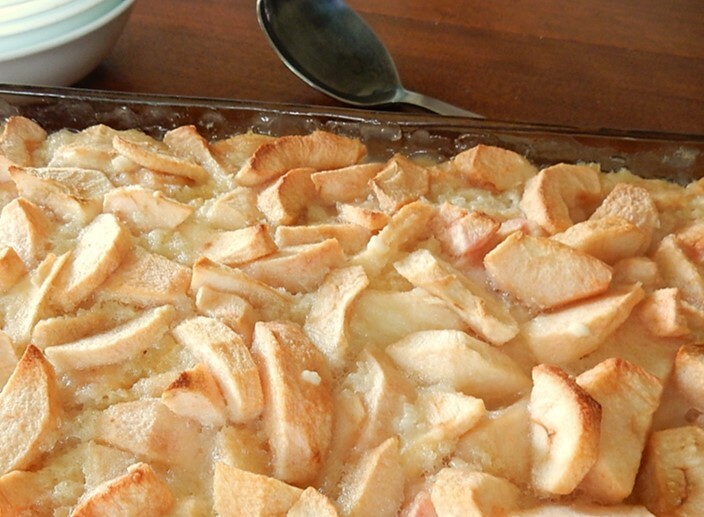 Even though this is an old recipe, apple pudding was “new” to me, too. I regularly make cherry pudding, and have occasionally made berry puddings, but never made apple before. Bring on Apple season – just around the corner! I’m lucky enough to have an early season apple tree in my yard, so I’ve been enjoying apples for the past few weeks. Just in time for the early apples! This looks lovely. It’s I nice old-fashioned dessert. I love the smell of baking apples. This looks delicious. I’m adding cinnamon and maybe some chopped walnuts for crunch. Thanks for the post. A delicious alternative to pie. mmm. . . your additions sounds wonderful. Walnuts, as well as the cinnamon, would be good in this recipe. You’re welcome. I’m glad you enjoyed this post. I’ve never had an apple pudding, at least not that I know of. It seems like an apple cake??? I’m probably not going to describe this very well, but the apple pudding is not as “cake-like” as a typical apple cake would be. It is moist and dense and embedded with apples – but quite good. In some ways the cake pudding part of this dish is almost a cross between a custard and a cake. A “moderate” oven meant you could hold your hand inside the oven (just inside the door) and count to 10 slowly–at least, I think it was 10–it has been a long time since I had to gauge the temperature of an oven with my hand. A moderate oven meant your hand could stay comfortably inside the oven door without getting too hot. I learned it from my grandmothers, who learned to cook with wood-fired ovens. This sounds so good! Thank you for interpreting and for sharing. It sounds good. Is it overly sweet though with all that sugar? The apples that I used were relatively tart; but, no, it didn’t seem overly sweet. No apple trees here, but I just happen to have a pile of ripe peaches, so I’m going to try it that way. The batter is very similar to what’s used down here for cobblers. I’ll be interested to see how closely the end product resembles what I get when I use my cobbler recipe. Sometimes I’ll do a biscuit cobbler, but my grandma’s is the recipe that’s more like this — which would be from the same era. Your comment about this pudding recipe being similar to your grandmother’s cobbler recipe reminded me of a post that Susan at A Little Sage wrote. Actually it’s a post she wrote for an orchard on the difference between crisps, crumbles, and cobblers. Your grandmother’s bread pudding sounds wonderful. I think that you’d like this recipe. I have lots of apples at the moment. This would be a good recipe to try. I am surprised at the amount of sugar though. Maybe the sugar content is needed to compensate for the lack of fat. You may be right. I think that I once read that low-fat foods often have a high sugar content to maintain a good taste and texture. My husband and I made this recipe today using Empire apples and per Nancyruth’s suggestion, added cinnamon (1/2 tsp) and chopped walnuts (1/2 c). Also reduced sugar to 1 cup. Baked it 1 hour and served it warm with whipped cream. Delicious. The way you adapted the recipe sounds absolutely wonderful. I’m glad you liked it. And, thank you for taking a moment to share how you made the recipe. The old recipes that I post on this blog are so sketchy–and people considering trying a recipe really find it helpful to know not only what I did, but also the experiences of other readers. Looks delicious! Maybe life wasn’t so bad back then, huh? Not if they ate like this. They had ate a lot of tasty foods back then. I didn’t know that. I assumed that most food was kind of bland or boring. Good to know, though.